For a start, the theme is engaging and consistent. The planets, solar system and looking into the future all feature heavily. And of course, all of this is geared towards your being able to win an impressive cash prize. Like all slots games, the aim is to accumulate as many identical symbols as possible on this 20-line, 5-reel production. Getting started is incredibly simple. All you need do is to select your stake and whether you wish to play a single game or use the Auto Play feature to spin 25 times at once. The minimum stake is just 5p and the maximum is £10, so this really is a slots game accessible to everyone. Once you start spinning, then the fun begins. The symbols are all part of the theme – Planets, the sun, letters and numbers, all forming part of a complex cosmic calculation. In particular, keep an eye out for the Saturn symbol. If you land 3, 4 or 5 Saturn symbols in the same line, then you will be handed a mystery amount of cash. Meanwhile, two or more crystal ball symbols will mean a ticket to the Crystal Ball Game. Each crystal ball will be filled with a different colour and if two or more are identical, then you will receive a bonus multiplier. 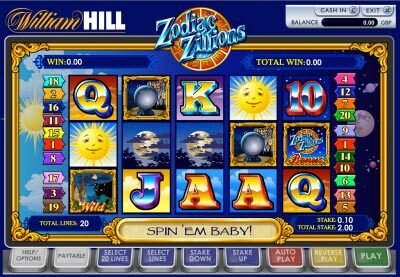 There is also the Zodiac Bonus Game, which allows you to gamble your winnings for a potentially greater prize. However, among the many features at Zodiac Zillions, perhaps the one that stands out is the Reverse Play button. Essentially this means, if you’ve activated this cool feature, that when you think you’ve won nothing, you are actually in the money. If you see that you haven’t hit a winning combination, Reverse Play ensures that from no winnings you actually cash in. This kind of novel feature is just another great reason to play Zodiac Zillions.